Even covered in fabric and crisscrossed with ribbons, a bulletin board is still a bulletin board. But in graceful golden wire, this message board is more like a decorative accent than anything else. We love how the wire crisscrosses down the rows, twisting whimsically all the way. And the curlicue accent on the top gives this piece presence. 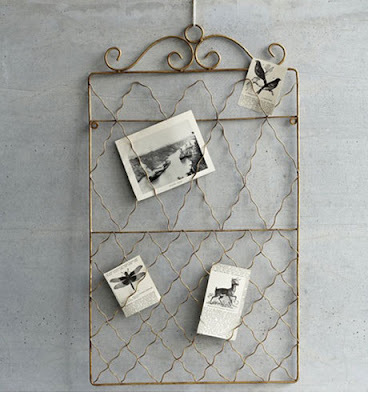 It’s a great way to display post cards, photos, or anything else that deserves more than just a magnet on the fridge.